RIYL - A British Western where the cowboys wear ascots rather than bandannas and pack martini's rather than pistols. It is insulting when every lazy music journalist follows the bouncing ball of a band’s press kit. 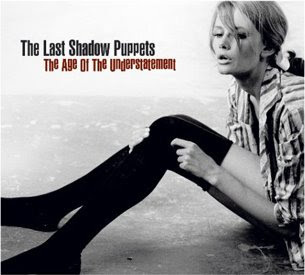 The false hype swears that The Last of the Shadow Puppets is a terrific take on Lee Hazlewood and Scott Walker. I am here to tell you that this comparison is an insult to both of these iconic songwriters / voices. I suspect that most of the writer's using that limp parallel don't actually own records by either artists but probably have the Arctic Monkey's record leading off their lame home collection of CDs. Just because a band says they listen to Bowie or Bond records doesn’t make them the next coming of anything. Let’s focus on the music on The Age of the Understatement and how this won’t last the test of time like the artists they are trying to align themselves with. #1 – Lee and Scott are LEGENDS. You can’t beat their clever lyrical content no less their voices that are so unique to themselves that you could recognize either in the time it takes to blink. The Last of the Shadow Puppets don’t come up to the knees of that kind of talent. #2 – An orchestra doesn’t make your songs better or more poignant. It just makes your weak kitchy songs sound bigger - not majestic or cinematic as some will try to convince you of. #3 If there wasn’t a Arctic Monkey’s connection I am rather certain reviews would not be as kind nor would the press take this record under their wing at all. #4 Pitchfork says : “vivid 1960s symphonic-pop pastiche” NME says:” tongue-in-cheek pastiche of late-’60s orchestral lounge pop zips” Hmmm…a nice example of how all the reviews must have been written by people on a conference call with each other to agree on how this record should be approached. Come on people, your readers deserve a more personalized review of the music. #5 There isn’t anything less interesting that a singer who approaches a vocal melody as if it was a tennis game. There is a core note which is then slid up or down into a new note and back we go again to the core note. It is a yo-yo trick worthy of a yawn. What we have here is a band playing dress up in a style that is borrowed heavily rather than owned. The opening track starts of with a gallop and off we go barebacked across the dusty plains yelling Rawhide to the wind with an orchestra as our posse. Somewhere along this journey we get lost among the cacti and Indians only to die of boredom in a ghost town. In 1984 Terry Hall of The Specials and Fun Boy Three formed a band with two members of the Swinging Cats and took a stab at pseudo-Spanish 60’s influenced pop songs highlighted by a bit of orchestration. The Colorfield, even though their sound was wrapped in retro, managed to write songs that stood out on their own. The lyrics strayed the listener away from tagging them as just another fun 80’s UK rock-lite band and took them down a pessimistic path; middle finger extended to their contagious, more hooks than a tackle box, acoustic guitar backbone. Paul Weller of the Jam tried to take his post Jam band Style Council in a semi-similar direction but belly flopped with all its bloated over indulgent R&B / Jazz flavor . The Colourfield's best record Virgins and Philistines which was released on Chrysalis in 1985 is a lost classic and is your best bet if you are seeking a record to take you in a time machine to the a timeless era where drinks were shaken, not stirred.